On Saturday 30th December 2017, Jeffrey Rogers took me and Joe Hollins (the vet) to one of the caves of the Island, called "the devil's hole". I think these are the first pictures ever taken there. Unlike most of the caves on Tristan, which are at sea level, this one is on the mountain around two thirds of the way up to the base. It was a challenging 90 minute hike to reach the entrance, along a steep narrow path. The cave has two chambers, and Léo estimates that in total it must be 40 to 50 metres long. The height varies greatly. They had to crawl to enter, but some cavities in the roof are quite high. In the breeding season, the cave is full of nightbirds*, but they had all already left by this time. The entrance of the cave viewed from the interior . Main chamber of the cave, Jeff on the left, Joe on the right. Rockfalls in the middle of the caves. Jeff in the second chamber. Jeff's dad knew the location of this cave, so it must have been known about for a long time, but few islanders have ever been there. 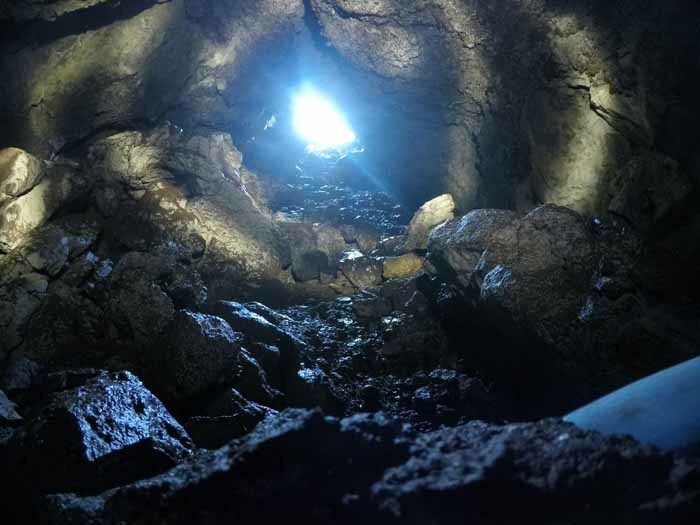 Anna Hicks, the island's volcanologist, says the pictures show an old lava tube, which would have been created as the mountain grew. 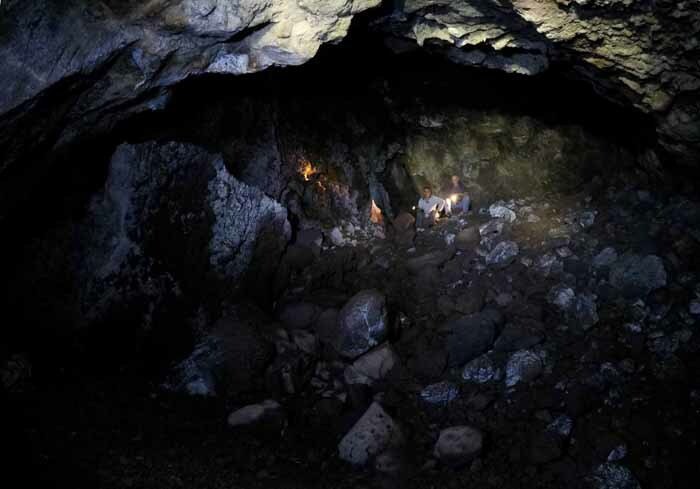 The picture of the second chamber shows the surface features of the lava tube walls clearly; you can make out what look like 'drips' where the molten lava would have stuck to the sides of the lava tube as it flowed through. 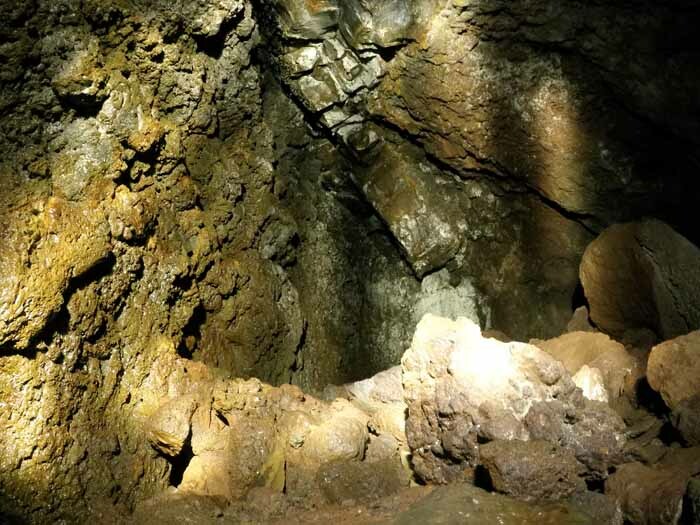 There are several other caves, tubes and vents on Tristan, as well as the famous 'Hill-with-a-hole-in-it' (Little Hill) on the southern plateau, which Leon Glass and Anna measured at 37 metres deep. 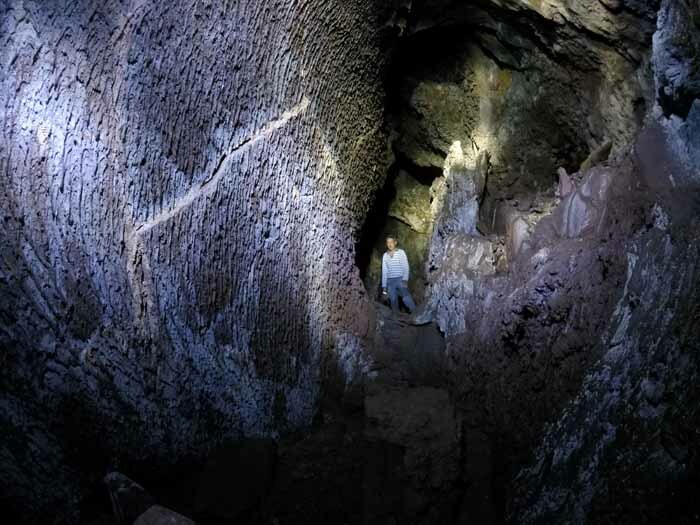 These caves might be spectacular, but they're not easy to get to. This is fortunate because they are often dangerous due to rockfalls within and at the entrances, and certainly some of the ones at low level have quicksand. A lot of islanders aren't that curious about these places, but visitors are often very curious. Fatal incidents have occurred, so they should be avoided. * Nightbird - Pachyptila vittata - also know as Broad Billed Prion or Whalebird.